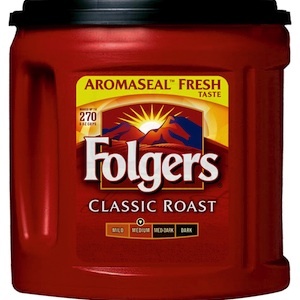 Folgers coupon is a printable coupon available only at Metro here. Select this coupon, print it off at home and bring it into the grocery store. They will accept your printed coupon. You can save $1.50 when you buy Folgers Ground and Roasted Coffee 292-920g. 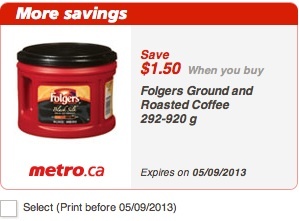 Folgers coupon is valid only in Metro across Canada. The coffee coupon expires on Sept 5, 2013. Aroma roasted and specially ground, this medium roast coffee has a smooth taste, which is sure to perk up your mornings.